What determines patients’ satisfaction with their mental health care and quality of life? Objectives: This study investigated whether patients’ satisfaction with their mental health care and quality of life is related to their age, gender, psychiatric diagnosis, and duration of mental disorder. Method: 120 adults of working age who were receiving input from a community mental health team in North Yorkshire were invited to complete the Carers’ and User’s Expectations of Services, User Version (CUES-U) questionnaire. This 16 item self rated outcome measure covers the issues that those using mental health services have identified as being their priorities. Results: CUES-U ratings were lowest for “Social life” (49% satisfied) and highest for “Relationships with physical health workers” (88% satisfied). Satisfaction with psychiatric services correlated significantly with patients’ age (Spearman’s r = 0.444, p<0.001) and their satisfaction in other areas of their lives such as housing, money, and relationships (r = 0.575, p<0.001). Those with psychotic disorders rated their quality of life as higher than other respondents (median total satisfaction score 12 v 9, Mann-Whitney U = 377, p = 0.001). Gender and duration of disorder were unrelated to service satisfaction. Conclusions: Patient satisfaction ratings have been promoted as an outcome measure when evaluating the quality of their mental health services. Certain factors influencing an individual’s satisfaction with the care provided (such as their age and general quality of life) are not directly under the control of professionals. CUES-U is a self rated 16 item booklet. It assesses seven key quality of life areas (“Where you live”, “Money”, “Help with Finances”, “How you spend your day”, “Family and friends”, “Social life”, and “Stigma and discrimination”) and nine areas of mental healthcare delivery (“Information and advice”, “Access to mental health services”, “Choice of mental health services”, “Relationships with mental health workers”, “Consultation and control”, “Advocacy”, “Medication”, “Access to physical health services”, and “Relationship with physical health workers”. Each area contains two main questions. Part A (“comparison”) gives a normative statement describing the situation if there was no problem arising. For example, Money: “You should have enough money to pay bills, stay out of debt and not miss meals. You should not have to feel isolated or cut off from society because of lack of money”. The respondent is then asked how their situation compares with this (as good as this, worse, or very much worse than this). Part B (“satisfaction”) questions whether the respondent is satisfied (yes, unsure, or no) with the issue described (table 1). The professionals participating in this study were members of a community mental health team in North Yorkshire serving a semirural population of 64 000. They included two psychiatrists, three community psychiatric nurses, two social workers, and one occupational therapist. A total of 120 patients were prospectively identified for recruitment from the mental health team records. After an introductory training workshop facilitated by the Royal College of Psychiatrists Research Unit, professionals gave a copy of CUES-U, together with a letter of explanation, to patients who were attending for normal clinical care. In order to reduce bias, respondents were asked to complete CUES-U without the assistance of mental health professionals. They were encouraged to seek help from family or friends if they had difficulties filling in the booklet. They were also given contact details for an independent advocacy service provided through the local mental health resource centre for support in expressing their views. Patients were requested to return CUES-U after that or the next clinical meeting. Participation was voluntary, and booklets were number coded to preserve anonymity. Mental health professionals were instructed to review the replies with their patient in session, in order to improve the individual’s clinical care. They also completed a standardised questionnaire recording the patient’s age, gender, duration of mental disorder, and diagnostic category according to the 10th edition of the International Classification of Diseases,16 before returning the booklets to a local data collection point. Data analysis was performed using the Statistical Package for Social Sciences version 10.0. Four “total CUES-U” scores were calculated by adding together individual groups of responses for quality of life items and service delivery items. For part A questions, this gave a “life comparison score” (seven items, maximum = 14) and a “service comparison score” (nine items, maximum = 18). For part B questions, a “life satisfaction score” (seven items, maximum = 14) and a “service satisfaction score” (nine items, maximum = 18) were obtained. As the CUES-U responses were categorical or ordinal, non-parametric statistical tests were applied. The CUES-U booklets were fully completed and returned by 86 (72%) patients. Table 2 describes the characteristics of responders and non-responders comprising the study population. The diagnostic category of psychosis includes schizophrenia, non-affective paranoid psychosis, and delusional disorders. Satisfaction with the quality of life items ranged from 62% (social life) to 77% (where you live) for part A questions and from 49% (social life) to 77% (where you live) for part B questions. Satisfaction with health services ranged from 73% (choice and access to mental health services) to 88% (relationship with physical health workers) for part A questions and from 72% (access to mental health services) to 86% (relationship with physical health workers) for part B questions. The total median scores (interquartile range) were 13 (10–14) for life comparison, 11 (8–14) for life satisfaction, 18 (16–18) for service comparison, and 17 (15–18) for service satisfaction. The comparison (part A) responses correlated significantly with the satisfaction (part B) responses (Spearman’s r = 0.863, p<0.001). Total service satisfaction scores correlated significantly with total life satisfaction scores (r = 0.575, p<0.001), total life comparison scores (r = 0.468, p<0.001), and total service comparison scores (r = 0.849, p<0.001). A patients’ age was significantly related to their total scores for service comparison (r = 0.356, p = 0.003) and service satisfaction (r = 0.444, p<0.001) responses but not to their scores for life comparison (r = 0.186, p = 0.12) or life satisfaction (r = 0.208, p = 0.08). For example, the median age of those satisfied with their psychotropic drug treatment was 45 years compared with 37 years for those who were dissatisfied (Mann-Whitney U = 386.5, p = 0.04). Patient’s gender was not related to their satisfaction or comparison ratings regarding quality of life or service provision. The total median score for service satisfaction was 17 for both men and women (Mann-Whitney U = 665, p = 0.99). The duration of an individual’s mental health problems was not related to their service satisfaction scores. However, those patients whose mental disorder had lasted more than five years (45 cases, 52%) were more satisfied with their quality of life than those with more acute disorders (median total life satisfaction score 12 v 9, Mann-Whitney U = 481, p = 0.026). Cases involving mental disorders present for over five years included a significantly higher proportion of psychotic and bipolar disorders (26/44 patients, 59%) compared with patients with disorders of a shorter duration (8/40, 20%, χ2 13.3, df =1, p<0.001). No significant correlation was found between age and duration of mental disorder (r = 0.08, p = 0.47). 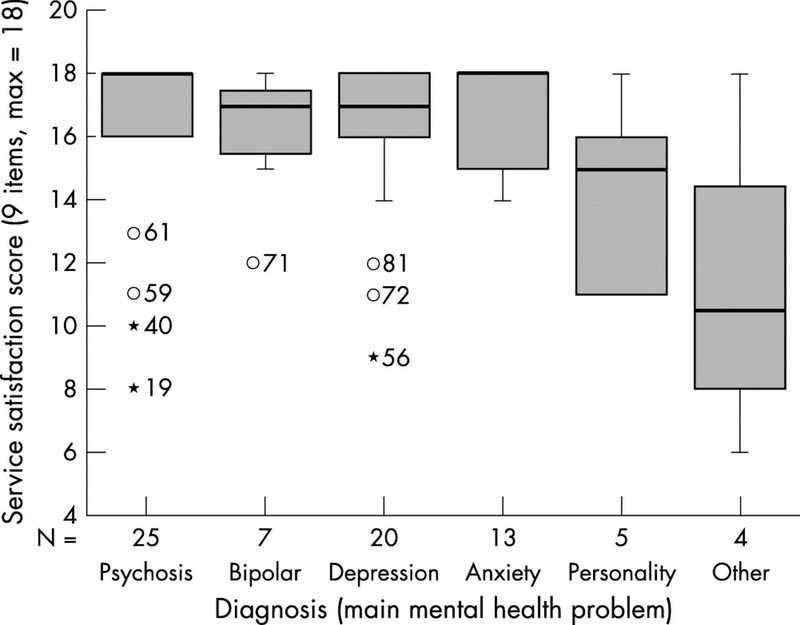 Total satisfaction scores for patients according to their psychiatric diagnosis are shown as box plot presentations in fig 1 (quality of life) and fig 2 (mental health services). The median satisfaction ratings were highest for those with psychotic, bipolar, and depressive disorders. Those with personality disorders were less satisfied with both their life and mental health services. Life satisfaction scores according to psychiatric disorder. The shaded box area is the interquartile range, containing 50% of the values; the dark line across the box is the median; the “whiskers” extend to the largest and smallest values within 1.5 box lengths; the width of the box does not represent anything; and circles represent outliers. Service satisfaction scores according to psychiatric disorder. The shaded box area is the interquartile range, containing 50% of the values; the dark line across the box is the median; the “whiskers” extend to the largest and smallest values within 1.5 box lengths; the width of the box does not represent anything; and circles represent outliers and asterisks represent extremes for individual variables. A post hoc analysis of satisfaction scores was performed according to whether patients had a psychotic diagnosis (including schizophrenia and bipolar disorder, n = 34) compared with a non-psychotic diagnosis (anxiety, depression, personality disorder, or other non-psychotic disorder, n = 52). Regarding satisfaction with mental health services, no statistically significant difference was found (median score 18 for psychotic versus 17 for non-psychotic categories, Mann-Whitney U = 564, p = 0.213). However, those with psychotic disorders rated their quality of life as significantly better than other respondents (median total satisfaction score 12 v 9, Mann-Whitney U = 377, p = 0.001). This study found that older age, the presence of major mental illness and perceived general quality of life are associated with a greater satisfaction with mental health services. Quality of life ratings were also higher in those with a psychotic diagnosis and those with mental health problems of a longer duration. The generally high levels of satisfaction expressed in this study are similar to those found in previous research using both mental17 and physical18 illness populations. Those with a diagnosis of psychosis, bipolar or unipolar depression all expressed moderately high levels of satisfaction for both their life and their mental health care. 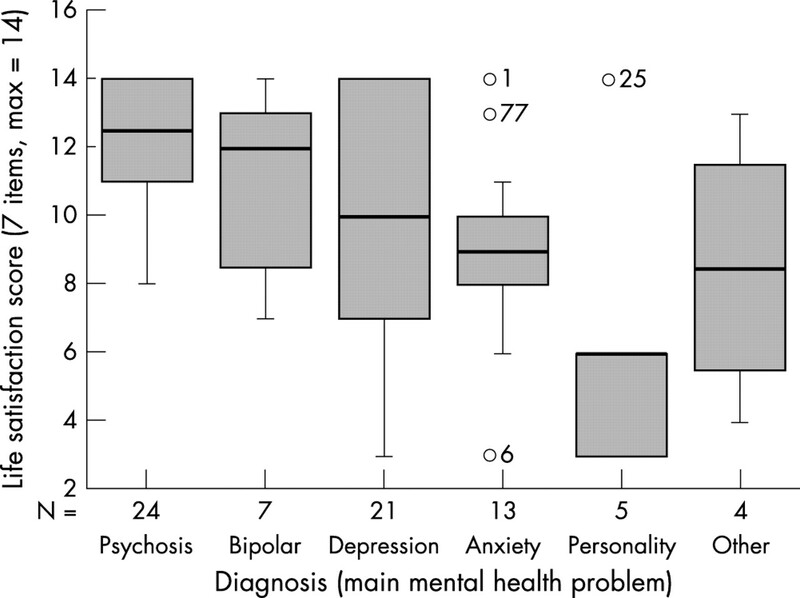 This may indicate that psychiatric services are being appropriately targeted towards those with severe and enduring mental illness, in keeping with the main aims of community mental healthcare reform in the United Kingdom.19 Conversely, the lower satisfaction scores seen in those with personality disorders are consistent with their common clinical presentation, which may include subjective complaints of boredom with aspects of life or dissatisfaction in personal or clinical relationships. Older patients were significantly more satisfied with their mental health care. One possible explanation for this finding is a cohort effect, with younger generations having greater expectations and older patients perceiving a greater sense of duty not to complain about the services offered. Alternatively, a drop out effect may be operating, so that those who are happy with their care are tending to remain in contact over time. In support of this hypothesis, previous research has shown that patients who inappropriately disengage from services are more likely to be younger.20 It is also possible that some respondents are continuing to engage with services not because of greater satisfaction, but because they are hoping that their workers will eventually find appropriate solutions to their difficulties. However, this study found no significant relationship between a patient’s age and the duration of their mental disorder. Moreover, the increased quality of life ratings in those with longstanding mental health problems compared with those of more recent onset suggests the occurrence of clinical improvement in their mental health over time, or at least an functional adaptation to and acceptance of the relevant disability. There are several methodological limitations to the above findings. First, the high levels of the satisfaction scores could be producing a “ceiling effect” masking any potential differences between patients. Second, respondents knew that their replies would be seen later by their main mental health professional, when discussing individual improvements to the standard of clinical care. Third, there is the possibility of a selection bias among responders, given a lack of data on satisfaction for the 34 patients who did not return CUES-U questionnaires. However, there is some evidence indicating that those who completed the study were not a selected group of compliant and satisfied customers. The sample population was predetermined at the outset using mental health records rather than clinically, and patient demographic data in table 2 is similar for both responders and non-responders. In addition, the range of satisfaction scores obtained in this study (49% to 88%) is comparable to that found during field trials for the CUES-U questionnaire (40% to 74%)13 in other clinical populations. Satisfaction with mental health services correlated significantly with satisfaction in other areas of patients’ lives such as housing, money, social life, and relationships. A recent study of individuals suffering from chronic arthritis or diabetes found that physical health status and whether patients were seeing a primary or secondary care physician explained only a small proportion (less than 10%) of the total variation in satisfaction with their care.18 Similarly, Ruggeri and colleagues found that diagnosis, disability, and functioning explained less than 14% of the variance in quality of life profile in patients with a mental health disorder.21 They did, however, note that service satisfaction, more than any other health indicator, was linked to relationships, leisure activities, and general wellbeing. This study adds to these research findings by confirming that the general quality of an individual’s life circumstances is closely linked to their satisfaction with mental health care. Despite recent attempts to integrate mental health services and social care provision,22 many of the factors affecting patients’ quality of life remain beyond the direct control of health professionals. Symptom severity and degree of functional disability account for only a small proportion of the variation in patients’ satisfaction with their health services. The moderately high levels of satisfaction with mental health services found in this study are related to an individual’s age, but not their gender or the duration of their mental disorder. Those with a psychotic disorder (schizophrenia or bipolar disorder) express higher levels of satisfaction with their quality of life than those with anxiety or personality disorders. However, around half of all respondents are discontent with their social life and how they spend their day. Patients who are happy with aspects of their life such as housing, finances, and relationships with family and friends are significantly more likely to be satisfied with the community mental health and primary care services provided. We thank the professionals and patients from Selby District Community Mental Health Services who participated in this study. We are also grateful to Paul Lelliott, Kim McLellan, and Maureen McGeorge from the Royal College of Psychiatrists Research Unit for their support. The complete CUES-U instrument is protected by Crown copyright. Further information on CUES is available from the Royal College of Psychiatrists’ Research Unit, 83 Victoria Street, London SW1H 0HW, UK (ww.rcpsych.ac.uk/cru). Rea CA, Rea DM. Managing performance and performance management: information strategy and service user involvement. Journal of Management in Medicine2002;16:78–93. Hoff RA, Rosenheck RA, Meterko M, et al. Mental illness as a predictor of satisfaction with inpatient care at Veterans Affairs hospitals. Psychiatric Services1999;50:680–5. Department Of Health. A national service framework for mental health. London: Department of Health, 1999. Powell RA, Single HM, Lloyd KR. Focus groups in mental health research: enhancing the validity of user and provider questionnaires. Int J Soc Psychiatry1996;42:193–206. Christopher KA. Determinants of psychological well-being in Irish immigrants. West J Nurs Res2000;22:123–40. Holley H. Quality of life measurement in mental health. Introduction and overview of workshop findings. Canadian Journal of Community Mental Health1998;3(suppl):9–21. Lovell K. User satisfaction with in-patient mental health services. Journal of Psychiatric Mental Health Nursing1995;2:143–50. Blenkiron P. Referral to a psychiatric clinic: what do patients expect? International Journal of Health Care Quality Assurance1998;11:188–92. Noble LM, Douglas BC, Newman SP. What do patients expect of psychiatric services? A systematic and critical review of empirical studies. Soc Sci Med2001;52:985–98. Barker DA, Orrell MW. The psychiatric care satisfaction questionnaire: a reliability and validity study. Soc Psychiatry Psychiatr Epidemiol1999;34:111–16. Holloway F, Carson J. Subjective quality of life, psychopathology, satisfaction with care and insight: an exploratory study. Int J Soc Psychiatry1999;45:259–67. Eklund E, Hansson L. Determinants of satisfaction with community-based psychiatric services: a cross-sectional study among schizophrenia outpatients. Nordic Journal of Psychiatry2001;55:413–8. Lelliott P, Beevor A, Hogman G, et al. Carers’ and users’ expectations of services—user version (CUES-U): a new instrument to measure the experience of users of mental health services. Br J Psychiatry2001;179:67–72. Lelliot P. What do people want from specialist mental health services and can this be measured in routine settings? Behavioural and Cognitive Psychotherapy2000;28:361–8. Department of Health. Effective care co-ordination in mental health. Modernising the care programme approach. London: Department of Health, 2000. World Health Organisation. The ICD-10 classification of mental and behavioural disorders. 10th edition. Geneva: WHO, 1992. Perera H, Perera R. User satisfaction with child psychiatry outpatient care: implications for practice. Ceylon Med J1998;43:185–90. Bidaut-Russell M, Gabriel SE, Scott CG, et al. Determinants of patient satisfaction in chronic illness. Arthritis Rheum2002;47:494–500. Barr W, Huxley P. The impact of community mental health reform on service users: a cohort study. Health and Social Care in the Community1999;7:129–39. Rossi A, Amaddeo F, Bisoffi G, et al. Dropping out of care: inappropriate terminations of contact with community-based psychiatric services. Br J Psychiatry2002;181:331–8. Ruggeri M, Gater R, Bisoffi G, et al. Determinants of subjective quality of life in patients attending community-based mental health services. The South-Verona Outcome Project 5. Acta Psychiatr Scand2002;105:131–40. Kennedy P. Is psychiatry losing touch with the rest of medicine? Advances in Psychiatric Treatment2000;6:16–21.